Happy fall! What to do those pumpkin seeds? Make Mole! At our last pop up (which was vegan), I did a vegan waffle dish with a pumpkin seed mole. I did this mostly because last week, we had done a full vegan wedding and the waffles were a request of the bride and groom. The only thing they had asked me was to make some of it savory with some sort of mole and something sweet. 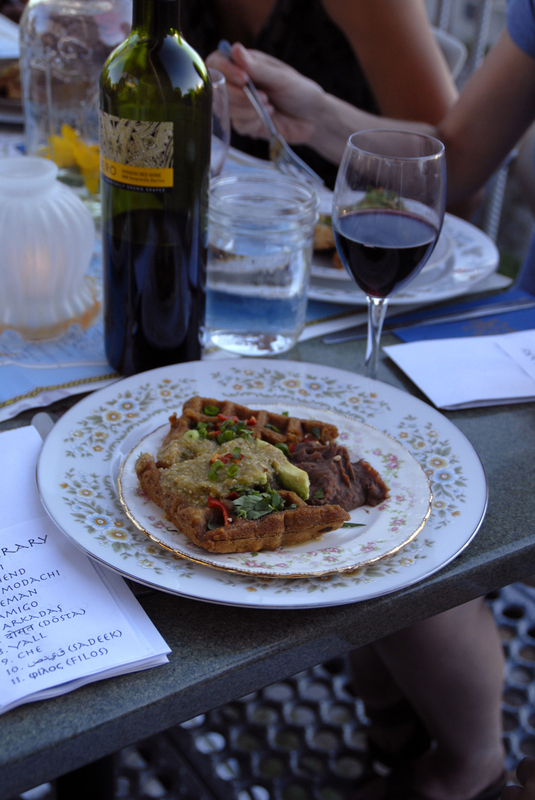 They had given me the waffle recipe, which everyone loved, from vegan chef and cook book author Isa Chandra Moskowitz. For the pop up, I decide to do our Tres frijoles (3 beans), sweet peppers, green onion, avocado and a pumpkin seed mole. Lots of folks loved the mole and ask for the recipe, I used the same recipe for the wedding and it was a hit. So I have decided to share the mole recipe. It does not just have to be used as vegan. I would suggest a little chicken and waffles for our carnivore friends, whom I know will love this Smokey and spicy (as you’d like) sauce. Roast your pumpkin seeds in an oven at 400 degrees for about 15 to 20 mins. Put everything into a food processor or blender and blend well. Make days ahead, it’s best a few days after you make it as most sauces are. Play around with it and make it your own!